Governor Jerry Brown signed an executive order Wednesday implementing California’s first-ever mandatory water restrictions that require cities and towns to cut their water usage by 25 percent over the next nine months. But Brown will not cut oil company water use for fracking because the industry pays over $20 billion in state and local taxes. Brown promised his extreme measures could save up to 1.5 million acre-feet of water, about enough water to fill Lake Oroville. But in an unsurprising gift to one of the state’s highest taxpayers, he exempted the oil industry’s consumption of 2 million gallons of water each day for production and processing of crude oil. Reuters reported that the state’s powerful environmentalist lobby is furious that oil companies that use between one to thirteen million gallons of water per well for fracking are being left outside of Brown’s mandatory water cuts. 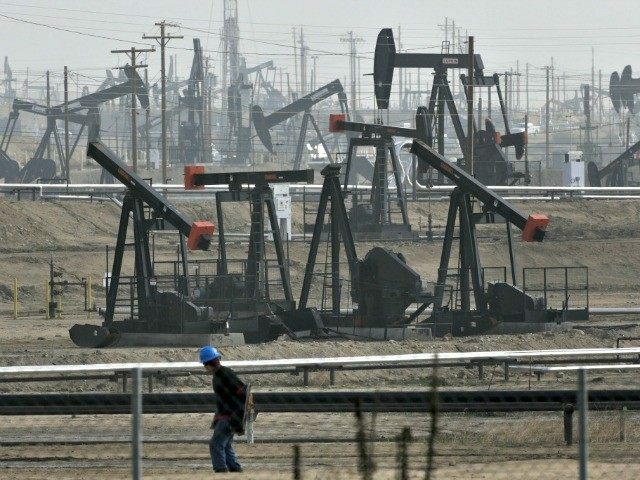 Breitbart revealed that the U.S. Energy Information Administration (EIA) released a Drilling Productivity Report (DPR) that fracking will continue in four major shale deposit regions because the EIA estimates that the break-even cost for just drilling and producing crude oil from fracking may have a $25 per barrel break-even price. California Monterrey Shale formation appears to be the largest potential region for “tight oil” shale deposits in America, and many operators are already using fracking techniques to drill wells in California. The Sacramento Bee reported that up to half of the hundreds of new wells drilled each year in the San Joaquin Valley are using fracking, according to a new study required by the 2013 law that regulates the practice. The California Division of Oil, Gas and Geothermal Resources sent letters in 2012 asking California’s oil producers to voluntarily post records for all their fracking activity on FracFocus. The petroleum industry agreed to comply, as long as they could withhold their chemical solutions mixtures as exempt “trade secrets.” After environmentalists screamed for full-disclosure or nothing, the oil industry has since refused to disclose. In an interview with the PBS Newshour, Brown indicated that curbing oil industry water use would not help a state that is so dependent on petroleum for gasoline and diesel. “If we don’t take it out of our ground, we’ll take it out of someone else’s,” Brown said. Governor Brown has tried to sound high minded about water use, but the real issue is that California’s State Budget is highly reliant on the oil industry revenues. CalWatchdog.com calculated that “The “Fiscal Contribution of Oil and Gas Industry for 2012” was $21.55 billion. That amounts to over twice the salary compensation for state employees last year. If Brown cuts oil industry water, he will have to fire state workers.